In another marketing effort to promote the new hacker drama Mr. Robot shortly prior to its premiere on June 24, 2015, USA Network teamed up with the social video platform and gamer community Twitch for a 72-hour “Hacktivation” campaign that erased more than $100,000 in consumer debt. Between June 18 and 20, users could watch a daily livestream of the hacking collective fsociety, which is featured in the series, on Twitch.tv/WhoIsMrRobot or WhoIsMrRobot.com/live for the chance to win instant cash. Developed by digital agency iStrategyLabs, the “Hacktivation” campaign was inspired by the Mr. Robot main protagonist, a hacker, and his mission to free people from the oppression of debt. Already two days before the start of the “Hacktivation”, USA Network started promoting and teasing the campaign to Twitch users by mysteriously “hacking” the Twitch livestream of the Electronic Entertainment Expo (E3) with messages from the fsociety. On June 18, the campaign officially kicked off with the first three-hour livestream on Twitch.tv/WhoIsMrRobot. Every 30 minutes, the hackers of the fsociety revealed a code that users could enter on the website WhoIsMrRobot.com along with their personal data. Up to 50 winners every half hour received instant payouts ranging from $10 to $5,000 via PayPal. 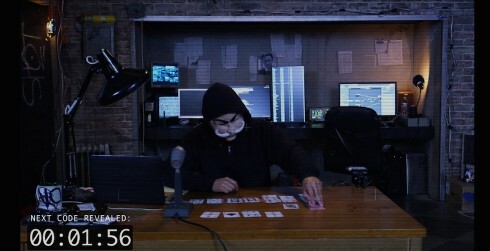 On June 19 and 20, the campaign then continued on WhoIsMrRobot.com, where the fsociety hosted two six-hour livestreams revealing more codes. The Mr. Robot TV premiere on June 24 was also accompanied by another debt deletion stunt. To receive a bonus entry and double their chances of instant cash, users could also enter the sweepstakes with a Tweet that had to include the hashtags #sweeps, #deletemydebt and #prizecode as well as the series’ official Twitter handle @whoismrrobot. 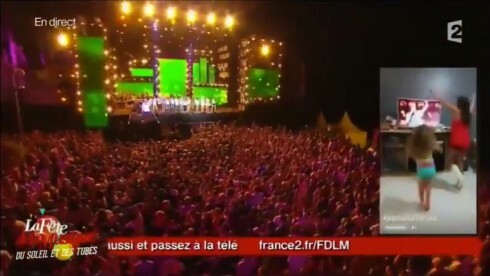 On the occasion of the 2015 “Fête de la Musique”, the annual global music festival taking place on June 21 every year, France 2 aired the special concert “La Fête de la Musique – du soleil et des tubes” the evening before. In the run-up to and during the event, the channel encouraged viewers to film themselves that evening using Twitter’s video streaming app Periscope for the chance to be featured on-air during the live broadcast. 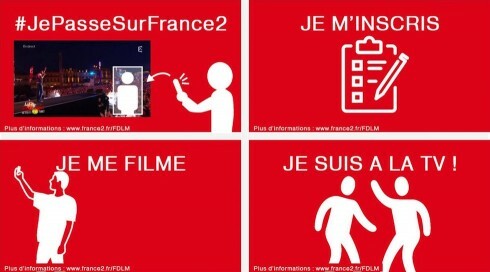 In order to have their Periscope stream potentially featured on-air, viewers first needed to fill out a registration form to give France 2 the permission to use their footage. On the day of the concert, viewers were asked to film themselves singing and dancing along to the music and to share the Periscope stream using the hashtag #JePasseSurFrance2 on Twitter. On June 12, 2015, Netflix released the third season of its original series Orange Is the New Black. Inspired by the story of main character Piper Chapman, who ends up in prison after carrying a suitcase full of drug money, Netflix teamed up with French advertising agency Biborg to launch a dedicated outdoor marketing campaign for the new season at Les 4 Temps, the largest shopping mall in Paris. The campaign kicked off on June 17, a few days after the worldwide release of season three. To activate passersby, Netflix and Biborg took over a giant 360° video screen at the mall and connected it to a phone booth equipped with a camera. Throughout the day, the phone booth rang every few minutes and dared passersby to answer the phone, and as a result to immerse themselves into the fictional universe of the series (video below). People who picked up the phone received a message that a prisoner from Litchfield’s Federal Prison is trying to contact them. To answer the call, they had to press 1 on the telephone keypad. After that, Piper Chapman began to share her story with the person at the other end. Simultaneously, a video of Chapman and the live reaction of the person who answered the phone were displayed on the giant video screen, allowing other people in the mall to follow the conversation on screen. 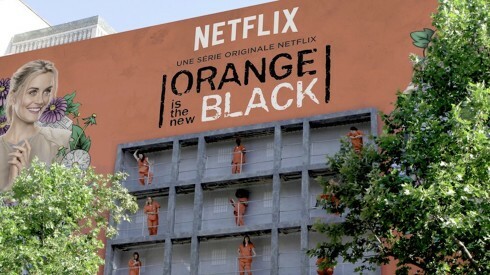 Before that, Netflix France had also teamed up with communications agency Ubi Bene to set up an enormous 360m² living billboard representing a prison at Boulevard Haussmann in Paris. Actors dressed as inmates of Litchfield, the prison where the series is set, moved into their prison cells in the morning of June 5, 2015. Netflix US also managed to activate fans in an outdoor campaign by putting up several interactive photo booths in Times Square in New York City. On June 9 and 10, fans had the chance to have a mug shot taken in one of the candle-shaped photo booths. The mug shots could not only directly be shared on either Twitter or Facebook, a selection of the photos taken in the booths was also featured on a digital double-decker bus in Times Square. Nicole Greiner is an author at VASTMEDIA, a Berlin-based company specialising in tracking and benchmarking digital activities of broadcasters, studios and TV producers worldwide.